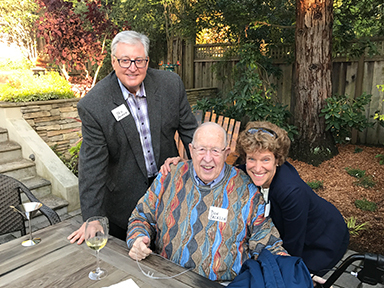 Allison Niday, Dominican Hospital Foundation board and Executive, Nominating, and Campaign Leadership committee member, recently hosted the Foundation Board Social at her home. This event was filled with appetizing wine and pizza made fresh by Allison and her husband Paul. 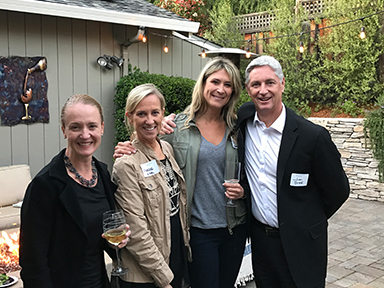 The board social allowed the board members to facilitate networking connections and enjoy a relaxing evening while learning about the Foundation's recent activities. 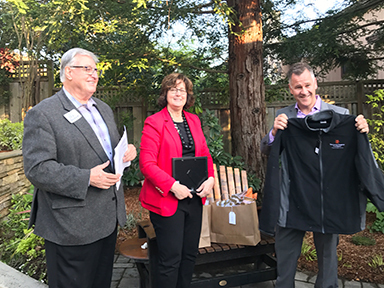 The Foundation recognized multiple outgoing board members, who will serve as lifetime board members. They will continue to spread our mission and values within the community. Jon Sisk was a member of the board from 2004-2017. Jon is the President of Lighthouse Bank, and served as President of the Dominican Hospital Foundation from 2013-2015 taking us through some major changes and certainly significant advancements. He served on the Executive committee and as Chair of the Investment committee. He has also served on Campaign Leadership and more. Michael Allard was a member of the board from 2008-2017. He is the Senior Vice President of Client Relations at Scharf Investments, LLC. Michael served on both Funding & Grants and Donor Recognition committees. Blaine Brokaw was a member of the board from 2008-2017. He is an Associate at ANB Insurance Services. He is the current Chair of the Investment committee, and served on the following committees: Executive, Investment, Funding & Grants, and Chair of the Grateful Patient committee. Joe Marini III was a member on the board from 2008-2017. He is the Owner of Marini’s at the Beach. He served on the Investment committee, Funding & Grants, and provided invaluable chocolates for all. Angela Reed was a member of the board from 2011-2017. She is an Associate at Comerica. She has served on Funding & Grants, Donor Recognition, and Grateful Patient committees. Please view the following photos from the Board Social. Ted Burke, Foundation president, Nanette Mickiewicz, Dominican Hospital Foundation, Jon Sisk, Foundation past-president, and Beverly Grova, VP of Philanthropy. 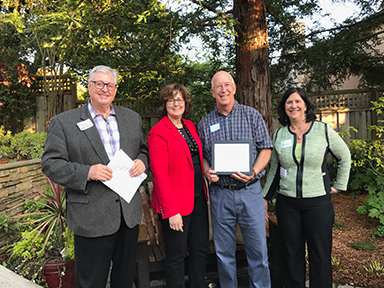 Ted Burke, Foundation president, Don Jackson, board and Bob Swenson Legacy Society member, with Carol Lezin, Foundation vice-president. 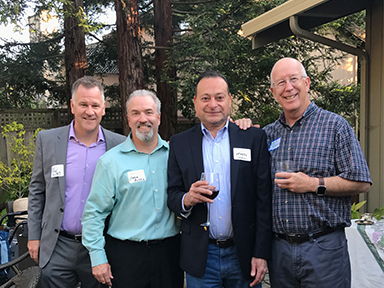 Board members enjoying the event featuring fire-grilled pizza and appetizers prepared by the Niday's; Michael Allard, Dean Austin, Magdy Ismail, M.D., and Blaine Brokaw. Ted Burke, Foundation president, Nanette Mickiewicz, Dominican Hospital Foundation, present Michael Allard with a certificate and gift in gratitude of his support of Dominican. Ciara Harraher, M.D., board and Physicans' Pteron Society member, Margie Sisk, Tiffany Hammer, board member, and Jon Sisk, past-president and served on multiple committees. 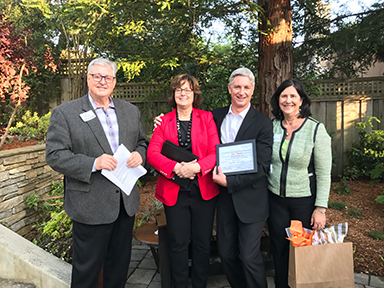 Ted Burke, Foundation president, Nanette Mickiewicz, Dominican Hospital Foundation, Blaine Brokaw, Foundation board and committee member, and Beverly Grova, Vice President of Philanthropy.